The team at TLC Surface Treatment are experts in handling all your sandblasting requirements in Perth. We provide industry leaders in the Perth mining sector with first-rate sandblasting services they can trust. Industrial sandblasting is a highly specialised procedure that requires specialised equipment and should only be done by a qualified technician with comprehensive experience, which is why we only employ the best. Abrasive blasting forces a stream of abrasive material against a surface at a high pressure to clean, prime or etch a surface, depending on what is required. 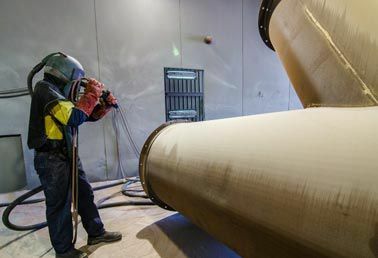 Due to the nature and scale of the equipment we are required to resurface, industrial sandblasting calls for specialised techniques and blast rooms. Using various spray guns, air guns and wheel blasting methods, your machinery will be given a thorough clean to remove surface blemishes, rust and chipped paint, and end up looking like new. TLC Surface Treatment consistently and timeously delivers quality, reliable sandblasting services. We take great pride in our work and value every satisfied customer that walks through our doors. In Australia, the most common reasons why sandblasting is a preferred method in the industrial sector, is that it prepares surfaces so that they are clean prior to starting various projects. It can also smooth or roughen surfaces of machinery equipment in preparation for applying a protective coating. Sandblasting surfaces will also increase the adhesion and durability of the coating. For experts in industrial sandblasting in Perth, contact TLC Surface Treatment for an obligation-free quote. We are Perth sandblasting specialists that commercial industries have come to trust. Alternatively you may submit an online enquiry. We look forward to your enquiry.